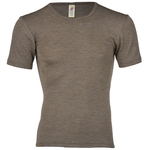 Thermal wool t-shirt will keep you warm and comfortable on cooler months. 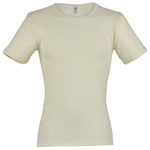 Made of non-scratchy merino wool and silk blend fine knit fabric - it is lightweight and super soft 100% natural fiber. Basic short sleeve shirt is a must have wardrobe essential for everyday wear during colder weather. 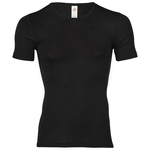 Soft and stretchy top is comfortable under clothing or worn alone.